The woods are rather drab at the moment , gone are the green leaves and the vibrant autumn colours. Not much growth on the woodland floor yet either. 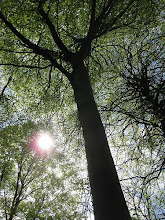 But spring will be with us and soon and the woodland will reawaken.